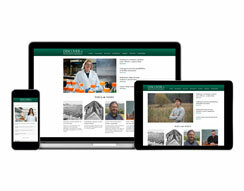 The mission of the Division of Research is to promote and support the research and scholarly activities of the Binghamton University community, and to foster an environment that encourages innovation and entrepreneurship. 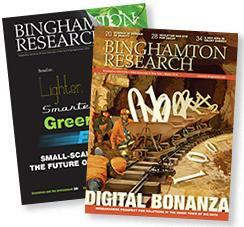 Binghamton had expenditures of $31.7 million in 2013-14, with more than 61 percent coming from federal, peer-reviewed grants. Binghamton’s Start-Up New York plan, one of the first to win approval, has already led to the creation of 83 jobs at five companies. Discover-e and Binghamton Research have won recognition from the Council for Advancement and Support of Education, SUNY Council for University Advancement and the Communications Association of the Southern Tier. Government Relations links Binghamton University with the community, elected officials, agencies and departments at all levels. Advances in imaging technology and tools mean that scientists have an increased ability to generate exciting data as well as to create compelling works of art. This contest offers an opportunity to share the beauty of science through photographs and images that describe some aspect of research captured visually. Images will be evaluated based on scientific significance, originality and artistic and visual impact. This year’s judges are: Hiroki Sayama, director of the Center for Collective Dynamics of Complex Systems and professor in the Department of Systems Science and Industrial Engineering; John Tagg, SUNY distinguished professor of art history; Anju Sharma, senior scientist in the Analytical and Diagnostics Laboratory; undergraduate Rebecca Kiss, photo editor of Pipe Dream; and alumnus and professional photographer Wasim Ahmad. Prizes this year will include a drone camera kit worth several hundred dollars for Best in Show as well as high-quality prints of the winning entries in each category. The winners will be announced during Binghamton Research Days at the exhibit’s opening reception from 4-6 p.m. Thursday, April 11, at the Center of Excellence on Murray Hill Road. Binghamton's Start-Up New York plan, one of the first to win approval, has already led to the creation of 83 jobs at five companies.